The islands are the home of the Aran sweater. The Aran knitting technique, developed over many generations, is well known throughout the world. It can be traced back to the time of the Book of Kells where there is a picture that appears to depict an ancient 'Aran jumper'. Many Aran stitches have a close relationship with Celtic symbols and motifs. 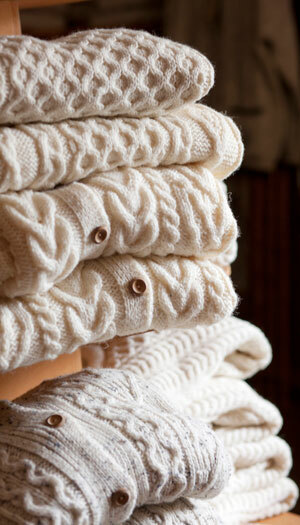 Part of the appeal and popularity of Aran Sweaters comes from the array of myths surrounding the garment. The moss stitch is said to signify an abundance of growth. The blackberry stitch represents nature. The Honeycomb is a said to be a lucky stitch, signifying plenty. Lattice or Basket stitches represent the old wicker basket patterns. The Ladder of Life and Tree of Life represent the stages of life. The diamond is a wish for success, wealth and treasure. The Aran Islands are an official Gaeltacht, which gives full official status to Irish as the medium of all official services including education. Most locals speak English with visitors but converse with each other in Irish. The islands are also known for their writers. One of the most famous Irish language poets of the 20th century Máirtín Ó Direáin was born and raised in the village of Sruthán on Inis Mór. Liam O Flaherty the world-renowned bi-lingual novelist and short story writer was from the village of Gort na gCapall in Inis Mór. The present-day modern Irish writer Darach Ó Chonghaile was born on Inis Meáin and now lives in Inis Oírr. The unusual cultural and physical history of the islands has made them the object of visits by a variety of writers and travellers who recorded their experiences. The culmination of this mode of interacting with the islands might well be Robert J. Flaherty's 1934 classic documentary 'Man of Aran' and John Millington Synge's work 'The Aran Islands'.